We’d love your help. Let us know what’s wrong with this preview of 3 Hour Dad by Adam T Hourlution. What would you do if you were suddenly told you were going to be a mum or dad without any notice? How would you react? What thoughts would go through your head? You haven't prepared to be a parent, you've not made any arrangements and nobody in your family is aware. Now imagine that not even the mum-to-be knew that she had been hiding a little person inside her tummy the e What would you do if you were suddenly told you were going to be a mum or dad without any notice? How would you react? What thoughts would go through your head? You haven't prepared to be a parent, you've not made any arrangements and nobody in your family is aware. This heart-warming and true story invites readers to step into Adam's shoes and experience what it is like to be a 3 Hour Dad. To ask other readers questions about 3 Hour Dad, please sign up. I recently finished a children's book where the protagonists was having an issue with the new arrival ( sibling) and I thought it would good to follow that up with this read by a 3 hour dad. Many of us are aware of the time that is spent preplanning before a new arrival. I mean, even if we don't have children ourselves, we have only to go to social media to see all the post of proud parents to be. But can you imagine being a parent to a concealed birth? YIKES! When life is going well it seems thin I recently finished a children's book where the protagonists was having an issue with the new arrival ( sibling) and I thought it would good to follow that up with this read by a 3 hour dad. YIKES! When life is going well it seems things do sneak up on us like an unexpected car bill, or the washer breaks down, but not 3 hours to prepare for a new bundle of joy that will be with us for the rest of our lives. I could not get through Adam's introduction without chuckling- or thinking how cool that his Star-Wars collection was almost complete. And by the time we got to the first chapter where he is talking about having a pizza ready to throw in the oven, I glanced out of the corner of my eye at my husband and laughed out loud. At which time he turns and gives me one of those, "What are you reading now- looks." Believe me, a lot more glances were sent in the hubby's direction when Adam relays to us readers about how he picked up the phone and went through a series of scenarios about why his mother in law was calling, before actually letting her finish her statement. Then to make matters even funnier you have a pregnant woman who is just as baffled by the situation, and she must be transported to the hospital by a panicked taxi driver. In closing, this book reads like a great comedy skit. ( One can say that - right- when it is not happening to them!) The first half of the book covers the 3 hours leading up to the delivery where the new arrival is coined by Adam as the 'gooey little thing' and it's shortly after this that readers learn what a U.C.O. is and I won't even mention here what Adam thought the umbilical cord was- you'll just have to read the book yourself. It was a shocking yet, a heart warming story. At first I did not understand what to expect. But while reading, I felt that I was a part of the story. The story as mentioned in the synopsis, unfolds about a young couple, Adam and Lyndsay happily staying together. When they least expect Lyndsay is admitted to the hospital with a severe back pain and within in three hours she gives birth to a beautiful baby daughter. The shock, love and mixed emotions runs through Adam and the other members of the fa It was a shocking yet, a heart warming story. The shock, love and mixed emotions runs through Adam and the other members of the family. It is amazing to see how they face with different problems and together how they overcome them. I have heard so many things about child-birth, but this was the first time I heard about a child birth that happened without any symptoms. Well, I must say that Lyndsay is really lucky and their baby daughter indeed is a miracle and a blessing to their lives. Each chapter is carefully written without any complicated situations. Therefore each word can be grasped with much care and the story gets into our heads without any trouble at all. Whilst reading each chapter I was engaged in it and I felt that I was a part of the story with Adam and Lyndsay. What more can I say, it is indeed an amazing story that you get to read, Once in a life time. This indeed was one of the best real life stories I’ve ever read!!! I highly recommend this fantastic book to anyone who loves to know how little miracles and fate hits in your life. This is an author's request. He contacted me via this blog and asked to review this book. At first, I wasn't sure what to make of the title of this book. Three-hour dad. What does that even mean? Does that mean being a dad for just three hours. That does not sound good to me. As it turned out, Three-hour Dad means the author, being the dad referred to in the title, only found out he was going to be a dad three hours before his wife gave birth. Yes, they didn't realize that his wife was in labor u This is an author's request. He contacted me via this blog and asked to review this book. As it turned out, Three-hour Dad means the author, being the dad referred to in the title, only found out he was going to be a dad three hours before his wife gave birth. Yes, they didn't realize that his wife was in labor until they've gotten to the hospital because they suspected his wife had appendicitis. Amazing, right? Or you'll wonder, how is that possible? It was explained in the book how the unexpected pregnancy happened. How his wife never noticed any of the symptoms or never had any of the symptoms of a woman who's pregnant. It seemed like an anomaly or more like a miracle. This book came to be because the author wanted to document that very special and unique experience, including the overflowing and unexpected kindness they got from friends, co-workers and other people. As the couple didn't know that they were expecting, they were not prepared also. There were no baby clothes shopping, or a crib to be assembled. None of that ever happened. When the author called in his office to inform that his wife was in labor, his office mates and boss were just as surprised. The office mates rallied together and chipped in and bought baby supplies and clothes for the coming baby. Friends also were very excited for the couple that they too bought baby things to give to the couple and to welcome the new baby properly. The couple was so overwhelmed by this flow of kindness. They never expected that their friends would be so generous and help them get everything ready for the baby instantly. It gave them courage to be ready to be instant parents. And with this very touching experience, the author decided that he too could pass on the same kindness to others. He decided that a random kindness or any small act of kindness goes a long way, just as it greatly helped his new family. So, with this in mind, he set out to do just that. Time and time again, he would go out into the streets and approach an unsuspecting stranger and give him a gift card to use for groceries or any other needs. You can watch a video of the same act here. Proceeds from the sale of this book also goes to helping more people. So, go and buy your copy now. It would go a long way. But you might ask, why tell the world that he's helping people. Why not just do it and not publicize it? He took a video not because he wants to publish that he's giving people this and that, or he wants to become popular, or be the next to thing to be trending on social media. He posted a video because he wanted more people to be moved and join in the random act of kindness movement. He wants it to become a lifestyle - that everyone will show kindness to strangers, especially strangers, whether it'd be small or not. He wants to start a kindness revolution. He wants to make kindness very popular that it will no longer be a novelty. A time when kindness will be just as ordinary as saying hello or probably as easy as blinking an eye. Oh, I would love to see that happen in this lifetime. With all that said, this book is worth your time. Reading through the author's personal miracle is just a wonderful feeling. That in spite of the problems and issues we are facing now and the world in general, there are still miracles that happen. There are still a lot of good things and good people. That there are still a lot of good hearts that could be moved and kindness that is absolutely deadly. Deadly because it will kill all selfish and self-centered thoughts. You will feel so grateful and thankful that you can't help but pass on the deed. You can't help but be kind also. You can't help but do the same kindness to someone and seeing the surprise and delight in that person's eyes is the greatest high one could ever experience. A thousand ways more potent than any drugs ever invented or any herbs ever discovered. Believe me, I have been a recipient of kindness a dozen or more times and true enough, the saying "Kill them with kindness," is absolutely true. I think I have died a dozen times and more and this is probably my 20th, 50th or 100th life. I give this book, 4/5 sets of cute baby clothes. A child is a gift, just as any amount of kindness is a gift to anyone. To the giver, what you give may not be much but to the receiver, who's desperate, you might just have saved him or saved his day. So, go on and spread the kindness. Any little thing done out of pure generosity, thoughtfulness and willingness to help will go a long way. It might just be what that person needs. Hope, even just a tiny spark is still hope. And in a dreary, desolate and desperate world, hope can light it up, even the darkest of corners. Thank you again, Adam T. Hourlution, for the review copy. I salute you for starting this kindness revolution. You are not alone. I know many others also tried and are still trying to achieve this very lofty and noble goal. I hope you will continue to inspire more people to join this movement. I know I am one and I have always been thankful for all the kindness that came my way. I try to do random kindness as much as I can because I know how it feels to be in need and desperate. One little spark is all a person needs. You can read more of my reviews at my blog The Book Chick. Adam contacted me and offered to give me his book for free, against an honest review. I do not take on many authors and try to choose well between all the request I receive each day. And this is the first time I received a true story I wanted to read. And such a sweet story it is. It's short, funny and cute. Perfect book to brake of with between two more heavy books. This nonfiction is about Adam and his most confusing three hours of his l You can read more of my reviews at my blog The Book Chick. This nonfiction is about Adam and his most confusing three hours of his life and the days that follows. His girlfriend is giving birth at the local hospital but neither of them knew she was even pregnant. I of course have seen, read and heard about those women who goes nine month and not realizing that they are pregnant until they are ready to give birth. For me it is incredible hard to understand how you can go nine months and not know. And it is really unbelievable to. And since it is so unbelievable, but apparently true, it is also one of my fears. Can you imagine the shock? Well I cannot and Adam does a fantastic job with this literary time travel, where he puts as an reader there, with him. I’d call this an adventure story. Anyone who has become a parent knows the extremes in emotion you go through, from joy to panic, and that’s assuming you both intended for this to happen and had time to prepare. But imagine you’re a couple who wasn’t planning on having a child right now and thought you were doing everything to prevent it. Imagine that the woman doesn’t realize she’s pregnant. Obviously, she can’t tell her boyfriend. But once she goes into labor, someone is going to figure out wh I’d call this an adventure story. Anyone who has become a parent knows the extremes in emotion you go through, from joy to panic, and that’s assuming you both intended for this to happen and had time to prepare. But imagine you’re a couple who wasn’t planning on having a child right now and thought you were doing everything to prevent it. Imagine that the woman doesn’t realize she’s pregnant. Obviously, she can’t tell her boyfriend. But once she goes into labor, someone is going to figure out what’s going on and the couple has to make the switch to parenthood with no time to prepare. There you have the premise of this memoir. It made me panic just imaging how I’d have reacted in the same situation. The author did much better and the story of how he reacted and how he views the situation now that it is a few years behind him is both humorous and inspiring. A fun read, as long as you don’t have to go through the experience yourself. The idea that you can be a father with as little as three hours notice fascinated me from the moment I read the blurb. It just proves how mysterious and incredible the human body (particularly the female body) is. From page one, you can feel the tension gradually building. A nostalgic husband, content with life, discovers his wife has been rushed into hospital after staying at her mother’s home. ‘I remember the final walk to the delivery roo The idea that you can be a father with as little as three hours notice fascinated me from the moment I read the blurb. It just proves how mysterious and incredible the human body (particularly the female body) is. ‘I remember the final walk to the delivery room door and how, as I got closer to the frame, it grew bigger by the second. I guess it was the fear of the unknown which frightened me. The author plays with light comedy that made my experience fun and realistic, as people often tend to joke when nervous or stressed. Ultimately, you can tell how happy the new father is by the end of this brief, yet inspiring tale. Overall, I really enjoyed this tale of unconditional love and the sudden need to adapt to life’s surprises. My rating? Easily 5/5 stars. This was fun and quick to read. Though only a This is a short, sweet and very conversational story. I enjoyed the narrative, and the informal nature of the writing made it feel like I was sitting around with a group of friends listening to one of then retelling the story with re-enactments, sound effects, moments of wonder, disbelief and awe. There were a few grammatical errors but again, this is conversational, thus those errors actually add character to, rather than detracting from, the story. Some days change your life so completely that you never forget them. For Adam, his day was when he got a call that his girlfriend was in the hospital – about to deliver a baby. Neither of them had any idea that she was pregnant. They had about three hours to wrap their heads around the idea of being parents before a little girl entered their world. Three Hour Dad: Reading is Believingis Adam’s account of their quick journey to parenthood. I was asked by the author to review the book through my blog. While I already had quite a list of book reviews to do when he asked, he assured me his book was interesting – and short. I was given a free copy in exchange for a fair review. Adam’s account of the finding out he was going to be a father and managing the first few days as a new family are told in a conversational way. I felt like I was sitting down with Adam and he was catching me up on what had happened in his life. There is a lot of humor thrown in, too, but it’s nice to read about a man who stepped up to the role of a father very quickly and proudly. Both of their families came together to support the couple establish a new home as a family, too. Three Hour Dad: Reading is Believingdid turn out to be an interesting and quick read. I would recommend it to anyone looking for a story that sounds too crazy to be true, but is. It would make a good vacation read or a story for a couple to read out loud together. This is a true story, an uplifting read which conveys the shock, panic, astonishment and pure joy of an unexpected new arrival. Adam likes his life the way it is; he has space and time to enjoy his hobbies and pastimes. He is definitely a 'lad'; his girlfriend is on the point of moving in with him and life is good. They have the time and money to spend enjoying their lives, packing in activities and holidays as the notion takes them. So a surprise phone call from his mother-in-law to be telling h This is a true story, an uplifting read which conveys the shock, panic, astonishment and pure joy of an unexpected new arrival. Adam likes his life the way it is; he has space and time to enjoy his hobbies and pastimes. He is definitely a 'lad'; his girlfriend is on the point of moving in with him and life is good. They have the time and money to spend enjoying their lives, packing in activities and holidays as the notion takes them. So a surprise phone call from his mother-in-law to be telling him that not only is his girlfriend in hospital but also in labour comes out of the blue. In the space of three hours, Adam leaves his single carefree life behind and realises he is now a family man, and takes on board the responsibility which comes with it. Never having had anything to do with children or babies - in fact, like a lot of young carefree men, he has actively avoided being in contact with them - to say the speed of events is a shock is a bit of an understatement. However, his writing conveys it all beautifully, capturing both the worry and happiness of this pivotal moment. This is a truly happy read, and you would need to be hard of heart not to have a smile on your face and a tear in your eye on reaching the final page. For a first time author, Adam writes a wonderful tale and one I am happy to recommend. We all need something to smile about and, trust me, this will do the trick. I don’t normally read very many e-books, especially short stories but when the author contacted me about the book I just had to read it because WOW! I’ve seen the TV shows, “I didn’t know I was pregnant” and they are so shocking. Now we get to see it from the dad’s point of view. It was a nice change to read about pregnancy and birth from a dad, especially in these circumstances. The author brings you through his thought pattern as he learns his wife is not just pregnant but GIVING BIRTH through I don’t normally read very many e-books, especially short stories but when the author contacted me about the book I just had to read it because WOW! I’ve seen the TV shows, “I didn’t know I was pregnant” and they are so shocking. Now we get to see it from the dad’s point of view. It was a nice change to read about pregnancy and birth from a dad, especially in these circumstances. It was a good read and what a story it will be to share with the child when the child is grown up. When I say one of my children was a surprise I just mean she wasn’t a planned pregnancy but this child REALLY was a surprise, right to the birth. What happens when fatherhood is thrown in your face? Well! You become a reluctant dad. And that, my friends, might as well be the title of this book. This is a bite-size novella that you can swallow whole. Short and sweet. I got so engrossed that I missed taking review notes and had to read it all over again. And did it with joy. Relatable humor all thru the book. It is a coming-of-age story of a 29-year-old boy becoming a man, blatantly skipping many pertinent steps. The man found it funny and decides to share it with us. And turned it into, what I call, a must-read for all guys. And girls too. For they can see what guys go through. You will laugh at bits. You will laugh at it as a whole. Just wish the book was longer. What I like most about 3 Hour Dad is that it has layers. Yeah, the same thing Shrek and Donkey talk about in that movie. One of the layers talks about social media and other tools. I too have gone thru bidding wars on eBay. And when I won, I couldn’t tell anyone because no one will understand my fascination for old coins. The posts on Facebook by the mother of his child bring in a deluge of question directed to him. These are so true in today’s world. This writer has done a good job showing how we are wedded to these tools. Adam's life changed beyond all comprehension when his girlfriend's mum phoned him in the night to tell him his girlfriend was in hospital having their baby. Just a few hours earlier his thoughts had been consumed by a eBay auction as he successfully bid on a vintage Star Wars figure, without the faintest idea that he was shortly about to become a father. Most of us who are parents have months to become used to the idea but Adam and Lyndsey had just a few hours. Only the weekend before they'd bee Adam's life changed beyond all comprehension when his girlfriend's mum phoned him in the night to tell him his girlfriend was in hospital having their baby. Just a few hours earlier his thoughts had been consumed by a eBay auction as he successfully bid on a vintage Star Wars figure, without the faintest idea that he was shortly about to become a father. Most of us who are parents have months to become used to the idea but Adam and Lyndsey had just a few hours. Only the weekend before they'd been on an activity weekend where Lyndsey had abseiled - completely oblivious to the new life inside of her. I must admit to feeling a little envious here, I had hyperemesis with my first daughter and had to go into hospital twice to be put on a drip so the thought of nine months of normality rather than weeks of vomiting is something I can barely imagine. What a wonderful true story! This is a short book but it is delightful. The author and narrator is Adam and he got a phone call one night that his girlfriend was in the hospital...having a baby! Neither one of them had any clue that she was pregnant and she was in denial that she was even in labor. Of course, once she was pushing she had to accept their new real I chose to read this book after receiving a free e-copy from the author. All opinions in this review are my own and completely unbiased. What a wonderful true story! This is a short book but it is delightful. The author and narrator is Adam and he got a phone call one night that his girlfriend was in the hospital...having a baby! Neither one of them had any clue that she was pregnant and she was in denial that she was even in labor. Of course, once she was pushing she had to accept their new reality. Although Adam was in shock, he stepped up and was immediately a caring father who learned quickly how to take care of his daughter. I received a review copy from the author and I voluntarily reviewed it. Thank you Adam T Hourlution! This was a quick and fun read! It is a humorous retelling of how the author became a dad to a baby him and his partner didn’t know they were going to have. It is great that the author found humour in such a shocking and somewhat traumatic situation. The author is such a great storyteller. He writes with honesty and personality. It is a refreshing read as well, taking you on his fast-paced emotiona I received a review copy from the author and I voluntarily reviewed it. Thank you Adam T Hourlution! The author is such a great storyteller. He writes with honesty and personality. It is a refreshing read as well, taking you on his fast-paced emotional roller coaster. Generally I am not a reader of books be it long or short stories. I stumbled upon this and as it was a relatively short story decided to take the plunge. Informative and quite emotional in parts but hard to believe this could happen - it obviously did. As you get to the end and link all the factors together you do feel that fate is a spooky thing. Verifed Amazon purchase -for some reason wouldn't let me post there. Having been pregnant, a story of anyone who can find themselves in surprise labour - WITHOUT EVER KNOWING THEY WERE PREGNANT! - is just fascinating to me. This little memoir gives us a dad's perspective on this extraordinary situation. Just finished reading this book and it's an adorable but very quick read! It takes you through the rapid change from fun-loving, innocent, twenty-something who is more interested in completing his Star Wars figure collection than saving money for the future all the way to a brand new dad with the overwhelming responsibility it brings. The author takes the reader through everything he was feeling, right from the first phone call in the middle of the night telling him to get to the labour ward fast Just finished reading this book and it's an adorable but very quick read! 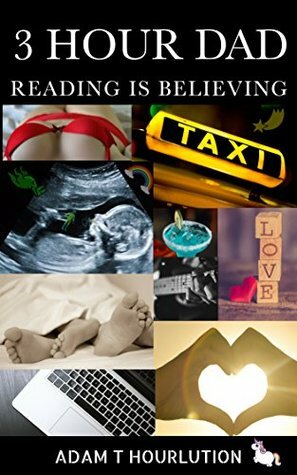 The author takes the reader through everything he was feeling, right from the first phone call in the middle of the night telling him to get to the labour ward fast all the way to unpacking all the new things for his surprise new baby! This fast-paced, truthful and comedic story filled me with gasps, laughs, joy and happiness of new beginnings. I read this book in just under an hour and thoroughly enjoyed the content written by Hourlution. Such an unbelievably, surprising story which I really enjoyed reading from Adam's perspective about his girlfriend giving birth and the journey that leads up to that moment. The way Hourlution has written 3 Hour Dad is absolutely perfect as he's written it in an honest way. I thought it was very well-written and would love to read more from this author. I wish Adam, Lyndsey and their family all the best!